Update 2017: Here’s the deal with 888 toll free numbers. It’s a fact that 1-800 phone numbers are nationally recognized as business phone numbers, however 800 prefixes are almost never available because they’ve been in circulation for so long (since the 60’s). Fortunately, the FCC has released additional toll free number prefixes (technically they’re area codes, but for some reason everyone in the telecom industry refers to them as toll free prefixes), here’s a complete list. A great alternative to the 800 number prefix is the 888 toll free number prefix release by the national SMS 800 number database. Your business can enjoy all the benefits of a traditional 1-800 toll free number using an 888 toll free number as your business line. Toll free 888 numbers are granted the same portability and ownership rules as other toll free numbers. Custom vanity 888 toll free numbers are also available for marketing use. Why get an 888 Toll Free Number? You own your 888 toll free number and can easily move it from one toll free service provider to another. 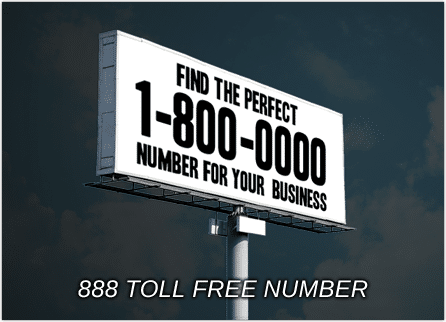 Vanity 888 toll free numbers are still available – you’d be hard pressed to find a vanity 800 number but the toll free 888 number prefix may still have some number combinations that work for your business. If not, you can always try the 877 toll free number prefix. Using an 888 toll free number gives your company an established nationwide presence. 1. 888 numbers are toll free numbers just like 800 numbers are. An 888 toll free phone number functions like other toll free numbers such as 877, 866, 855, 844, 833 and the traditional 800 number prefix. Toll free 888 numbers are regulated by the FCC and the SMS 800 database (which has renamed itself Somos) in the same fashion as all other toll free numbers. 2. 888 numbers are as good if not better than 800 numbers. An 888 toll free number gives your small business an established nationwide presence and the instant credibility associated with using a toll free number. And you have the same ability to port 888 toll free numbers from one toll free service provider to another as you do with all toll free numbers. You might consider getting an 888 number over an 800 number simply because 800 numbers are older and have likely been recycled. In other words, the 800 number could have been used by multiple businesses since it was first available in 1964 and therefore you might get more spam or wrong number calls than you would with a younger toll free number like 888 or 877 etc. 3. You might have trouble finding a good vanity 888 number. 888 numbers are much younger than 800 numbers but they are still over a decade old and therefore many/most of them have been snapped by existing companies. Since the spear pool of 888 numbers is low you might have trouble finding good vanity 888 numbers. For the most vanity number options you might consider a newer toll free prefix such as 855, 844 or 833. UniTel Voice has access to a huge database of available numbers and you can search it in real time on our sign up page before you decide to purchase service.